This true high-temperature silicone system was developed from a proprietary blend of resins and pigments to provide service up to 650°C. Temperature limits vary with colour and gloss. It is designed to be a smooth or textured coating for steel and aluminium substrates. It can be formulated in a variety of colours, textures and metallics. This product is formulated in a full range of gloss and textured effects. It is suitable for steel and aluminium substrates. This medium heat resistant coating is designed to provide continuous service between 180°C to 200°C and intermittent service up to 230°C. 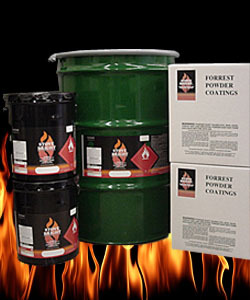 This decorative coating is designed for fireplaces and general interior use. This medium service temperature formulation contains a blend of resins and pigments designed to provide continuous service up to 200°C and intermittent service up to 280°C. If you are a UK company with high temperature powder requirements Contact Us today.